Your physician will recommend conservative treatment options to treat the symptoms associated with UCL injury. If conservative treatment fails, surgical reconstruction is performed. PRP and orthobiologic injections: A non-invasive treatment used to increase blood flow to the injured ligament to promote healing. If conservative treatment options fail to resolve the condition and symptoms persist for 6 -12 months, Dr. Patel may recommend UCL reconstruction surgery, also called Tommy John surgery, which involves replacing the torn ligament with a tendon from elsewhere in the body or from the cadaver. 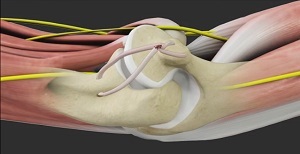 The most frequently used tissue is the Palmaris longus tendon in the forearm. Dr. Patel will make an incision over the medial epicondyle area. Dr. Patel drills holes into the ulna and humerus bones.